2 Dine 4 has been very proud to cater The Ronald McDonald House's largest fund raiser, Bandana Ball. This year's Ball raised over $525,000 to support families who have children healing in the hospital. Over 860 guests gathered at The Wild Onion Ranch, for a fun night of classy country charm that included photos with Texas long horns, live music, Texas Whisky, and bidding on both live and silent auctions. Our staff dressed in theme, with blue jeans, and red bandanas, and provided guests with signature cocktails, small bites, and lots of smiles as they entered the ranch. Guests milled about the silent auction listening to county music in the Texas sunshine. As they settled down to eat we provided a buffet of Tex-Mex favorites for the guest and poured red and white wine for each table. In Texas Tailgating is serious business. When The Law Firm of Vinson & Elkins had a vision of the perfect tailgate party to thank their clients they called us to help them make this vision a reality. We knew that the first ingredient to the perfect Tailgate party is a great location. We had our staff camp outside the stadium to ensure that our clients had the best seats in the house. Then we brought in award winning pitmaster Jay Tinney and his wheeled BBQ trailer to prepare quail, sausage, and ribs for the football fans. Of course our guests also needed something to watch the game on. We had giant screens and satellites brought in to ensure nobody missed a moment of the action. 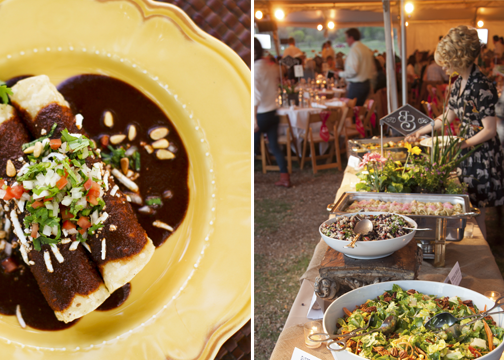 We love traveling at 2 Dine 4 Fine Catering so when our clients Scott & White wanted a custom menu for their corporate gala we packed our bags, gathered our staff, and headed over to Temple, Texas. We worked hand-in-hand with the event designer to make sure that the tables, flatware, and centerpieces all had a composed and polished look.